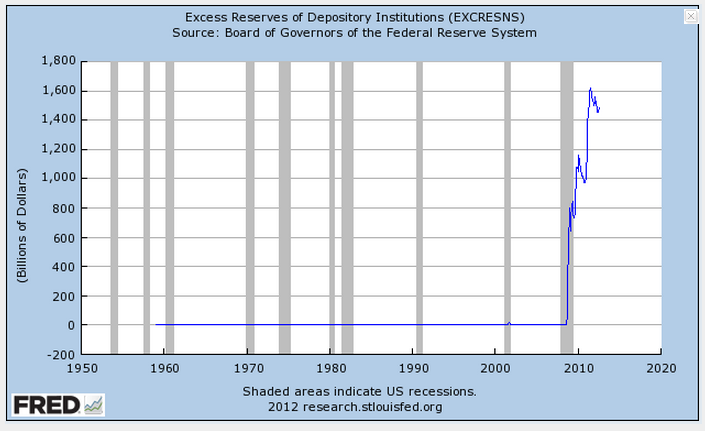 The above (Excess Reserves of Depository Institutions. 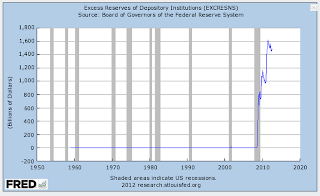 ): " increase in excess reserves is seen by many to be a sign that inflationary pressure will come to the U.S. economy and the U.S. dollar." " One simple model for determining the long-run equilibrium exchange rate is based on the quantity theory of money: MV=PT. Money x Velocity = Price x Transaction. A one-time increase in the money supply is soon reflected as a proportionate increase in the domestic price level (everything becomes more expensive). The increase in the money supply is also reflected as a proportionate depreciation of the currency against other foreign currencies. " " The question is, how much depreciation will we see in the U.S. dollar against the real currency, gold? "